In Part 1, we tried Sweet Potato Pancakes. Delicious, fluffy, easy to make, they are a good first line of attack in combatting the orange blob. But using up less than a cup of puree per batch, be sure to have a back-up plan. In Part 2, we made a more concerted effort with a big panful of sweet potato cinnamon rolls. These used only slightly more puree, but were equally delicious and potentially capable of inducing a sugar coma. 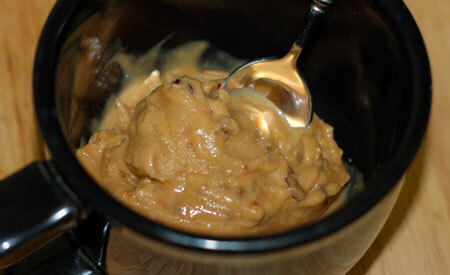 Today, in Part 3, I turned to David Lebovitz for guidance, and made a batch of sweet potato ice cream with wet maple pecans. Fresh from the machine, this ice cream tasted super-sweet from the maple, with a slightly starchy texture from the sweet potatoes that put me off a bit. I had to concentrate on the texture of the pecans to put it out of my mind, so I was glad I decided to make them. 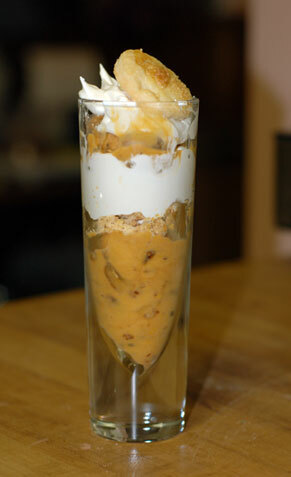 Last night, as a break from all the apple and pumpkin, I made us some little sweet potato “pie” parfaits, layering ice cream with whipped cream and our last few pie crust cookies (which turned out to be the ideal garnish). I think that the ice cream was more balanced after it had a chance to cure: less syrup-sweet and less yam-starchy. In any case, it was a highly successful reincarnation of a leftover side, certainly worth making again. Heat syrup in a small saucepan, just until it reaches a full boil. Add the nuts and bring back to a boil. Stir and cook for 10 seconds, then remove from the heat and cool entirely. The nuts will remain wet and sticky. Prepare shortly before use, as advance preparation can make them lose their crispness. Source: Adapted for leftover sweet potatoes from The Perfect Scoop , by David Lebovitz.